The 350 Bay Area Regional Legislative Committee reviews and takes actions on bills as they are introduced and make their way through the state legislature. 2018 is the second part of a 2-year legislative session that resumed on January 3rd. Some bills have been “carried over” from September 2017 – these are called 2-year bills. We are still evaluating climate bills for 2018 and will be reviewing additional legislation through mid-February and updating this list at that time. 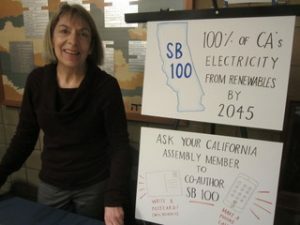 SB 100 (Sen. De Leon) calls for 100% clean, zero carbon electricity by 2045. Currently the state must achieve 33% clean, carbon free electricity by 2020 (we are on track to blow past this goal and may even reach 50% by 2020!). This bill passed the Senate in June, 2017, and now must pass in the Assembly, where it got hung up at the end of the session last September. SB 100 will accelerate the state’s current clean energy goals. Actions: Check out this blog post on ways to reach out to your legislators and let them know that you support SB 100. SB 834 and AB 1775 are two identical companion bills that give the State Lands Committee more power to block unloading and transport of oil from new offshore drilling operations. This could help the state block new coastal drilling in federal waters, because at some point that oil needs to come through state waters and onto the shoreline to be shipped. AB 1745 – Clean Cars by 2040 – would specify that the state phase out the registration of new internal combustion (oil burning) cars and light trucks by 2040. Groups are talking with the author (SF Assemblymember Phil Ting) to see if this date can be moved up. We will be working with our Transportation Committee on this transformative bill.